Beef Chimichangas filled with a ground beef/refried bean mixture seasoned with chili powder, cumin, and oregano, rolled up and fried until crispy, and covered with cheese and jalapeno tomato sauce tastes so much better than restaurant chimichangas. They are sure to be a family favorite. In fact, this is the recipe my son requests more than any other. I don’t make these Beef Chimichangas often since they are fried, but every now and then I’ll make them when we are craving some Mexican food, but it’s not a convenient night to go out to eat. Plus, cooking chimichangas at home is much more economical than going out to eat. Sometimes I make the filling and sauce ahead of time and then all that is left to do is roll them up and fry them. Super easy meal. Serve with this Mexican Rice for a meal that rivals any Mexican restaurant. For more amazing Mexican-Style Recipes follow Spicy Southern Kitchen’s Cinco de Mayo Pinterest Board. 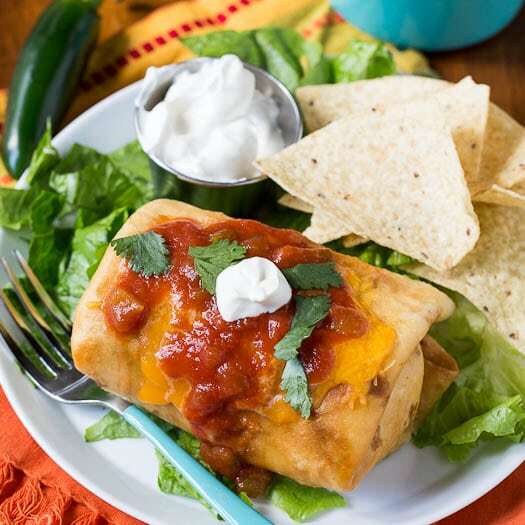 These ground beef Chimichangas are sure to become a family favorite. Filled with a ground beef/refried bean mixture, fried until crispy, and topped with a jalapeno tomato sauce. Brown ground beef in a nonstick skillet. breaking it apart with a wooden spoon as it cooks. When it is about halfway cooked, add onion. Once onion is softened and beef is cooked, add garlic, chili powder, cumin, and oregano. Stir to mix and cook 30 seconds. Add refried beans and 1/2 cup tomato sauce from the 8-ounce can. Save leftover tomato sauce to add to sauce. Stir to mix and remove from heat. In a medium saucepan, combine remaining tomato sauce from 8-ounce can plus the 15-ounce tomato sauce. Add the green chilies and jalapeno. Place over medium heat to warm. If tortillas are not very pliable, heat in microwave for about 20 seconds covered with a damp paper towel. Place about 1/3 cup filling towards one side of a tortilla. Fold over the side nearest the filling to cover the filling. Fold in the two sides and roll up. Secure with toothpicks. Repeat with remaining tortillas. Heat about 2 inches of oil to 375 degrees in a Dutch oven (or whatever type of pan you like to fry in). Fry 2 chimichangas at a time, about 2 minutes per side. Drain on paper towels. 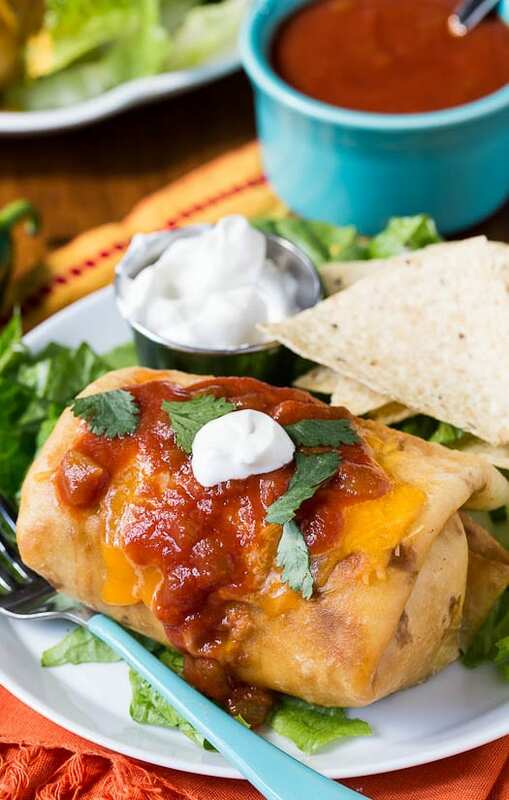 Top chimichangas with cheese, sauce, sour cream,and cilantro. The filling can be made a day ahead of time and refrigerated. Just microwave it to warm it up before using. 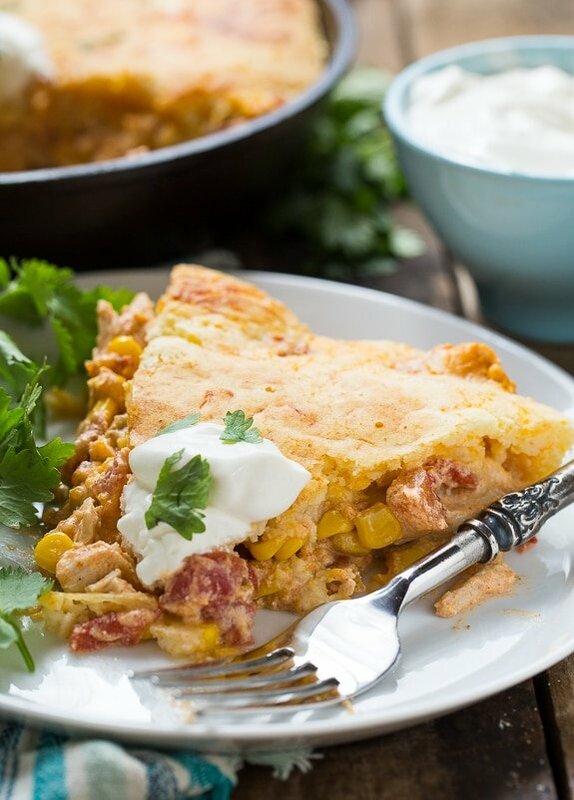 Mexican Chicken Cornbread Casserole– ready start to finish in only 30 minutes! This entry was posted in Dinner, Main Dishes and tagged beef, ground beef, Mexican. Bookmark the permalink. I’ve been looking around for a nice recipe like this…could you possibly use enchilada sauce instead of tomato…its way too bland for my liking…or are there other spicy substitutes for the tomato sauce. Thank you! Why do people who have not made the recipe comment about it? Since the beginning of time, I’ve asked this very question. Worse, though, is a five star rating to accompany the comment. These look delish! Just wondering.. what do you think they would turn out like in an air fryer? Gonna try it I think.. I don’t have an air fryer Christine, but I’ve been wanting one for a long time. Which one do you have? I think I’m going to get one and I’ll give the chicmichangas a try in it. I was looking around for recipes that I have never made before and came accross this one. It is amazing! My husband is not very fond of re-fried beans but he loved them in this Chimichanga. Afterwords he told me that Chimi’s are the only mexican he likes, and he thought these were better than restaurants! Thank you so much for introducing me to something new that I can make again! Made the rice to and it is great! I will be visiting your site often! That makes me so happy that you and your husband enjoyed the chimichangas so much Holly! My son is always asking me to make these. I think the refried beans are just perfect in them. They make the chimichangas taste a little creamy. Hope you enjoy many more of my recipes! Just made these and not sure what all the sauce is for? I just put it in the fridge, we will have spaghetti tomorrow but it tasted good otherwise! Thanks for the recipe! Never had one but this looks fantastic and I can’t wait to make for the family. I have never tried a beef chimichanga before! Thanks for sharing the great recipe.. as a Mexican food lover, they are definitely something that I need to try! 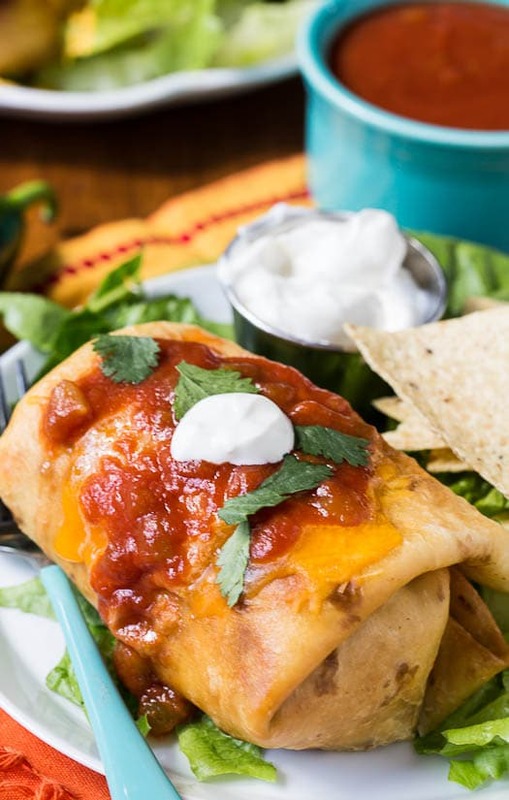 I will take homemade beef-chimichangas over restaurant ones anyday – these look delish! check out my Cold Broccoli Salad! I’ve actually never had a chimichanga, but this one looks and sounds so so delicious!! Mexican food is my absolute favorite food. You just can’t beat those flavors. 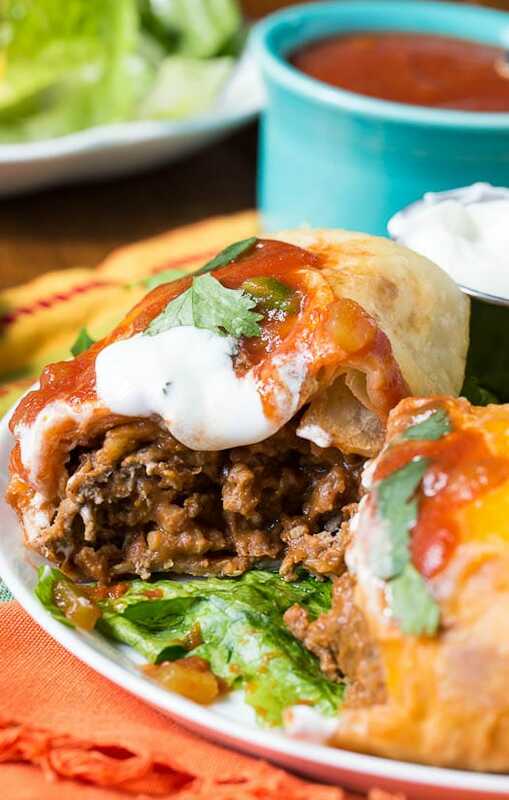 These beef chimichangas look like perfection! You can’t beat those crispy tortillas. Yum! Mmmm chimichangas are one of my favorites!! Love this homamde version! Pinned! I love Mexican food Christin, so I can imagine loving these. And, Mexican food has gotten really expensive lately, so it’s awesome that we can make them at home! My husband and son love Beef Chimichangas, we have a local fast food restaurant and they stop every Saturday. Now we can make our own during the week. These look delicious! I love when you can premake the filling and then assemble when you get home from work. Great photos! Yes yes yes! Oh my, it’s breakfast time and I would still eat a plate of this right now! haha along with some of that mexican rice! This looks sooo good. Oh my heavens! I thought I was full…but now I’ve seen these and I want a big plate of Mexican food. Talk about the ultimate comfort food! I love chimichangas, especially with beef. Pinning! These look like the ultimate chimichangas, Christin! And I love that you can make the filling ahead of time. I’ve never tried to make my own before, so I can’t wait to test out this recipe! Pinned! I have been craving a chimichanga from my favorite Mexican restaurant, but I’ve been trying to be so good about eating out. Now I can be good AND still have a chimichanga! 😀 Christin you are awesome I am pinning this right now.